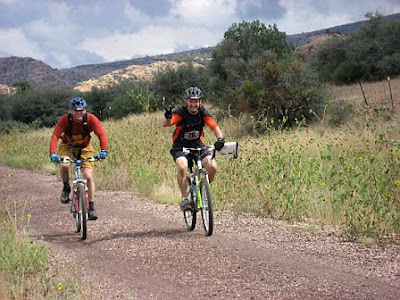 Last night I registered for The Annual Gilmore Adventure Race in Prescott on September 20th. Irene is my teammate again. 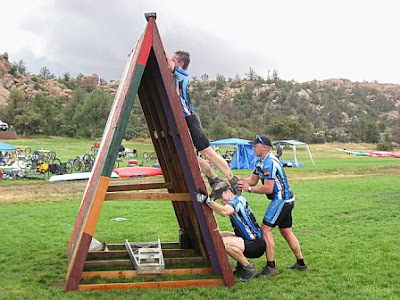 We are doing the beginner level course which is 12-15 miles of orienteering, trekking, mountain biking, and of course the mystery events. I guess this would be a good time to re-learn how to ride a bike. Bikes and me - we're not friends. As a kid, I was always nervous with the way that you lose control of your steering when you go through a sandy spot on the street. When the neighborhood kids rode everywhere, I was always at the tail end of the pack because I was too scared to ride as fast as the rest of them. As an adult, during my very brief stint as a mailman, I failed the bicycle test during training. They put a bunch of phonebooks in the front basket of the bike and you had to ride a course. I just could not get that bike to turn without tipping over. Embarrassing. And now I have paid money to ride a bike. In a race. On a mountain. I'm an idiot. This picture from last year tricked me into thinking that it was something I could do. The steep, rocky, mountain biking stuff was certainly in the backwoods where there weren't spectators to take pictures, but I'm going to keep believing that the whole bike route will look like this: The mystery events from last year included going over an A-frame, which is a lot steeper than the ones in agility trials! It seems like these big, stong men shouldn't be having such a hard time with it. They also did something with a frisbee. Hopefully they won't repeat the frisbee game, as I'm even more hopeless with a frisbee than I am with a bike. 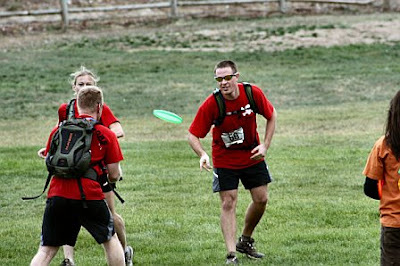 I try to flick the wrist, I try to keep my elbow stationary and do everything people suggest, but I really have no body control and the frisbee always goes careening 90 degrees off from the direction I intended. Sorry, Irene - it's too late for you to back out now. Thank you for making my entire day with this quote: "As an adult, during my very brief stint as a mailman, I failed the bicycle test during training." God love you, Ms. Diamond. I can't believe you just blogged about failing the bicycle test for mailmain training. now the whole world knows. I am falling out of my chair with laughter.